Use your browsers return or back button to return to this page. Behind Bow Bridge is the Langham apartment building. GUESS WHO? Warner Brother's biggest star...but the Duck disagrees. 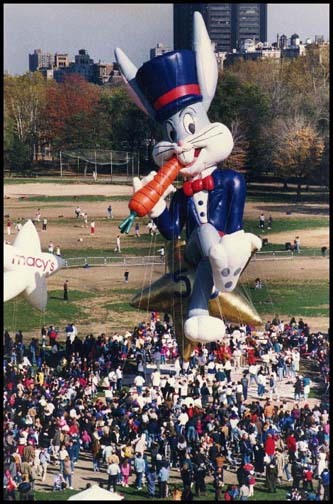 Macys was flight testing their brand new balloon a few days before the Thanksgiving Day Parade. Late in the day solitude...until some crazy photographer appears on the scene. The castle lies along side Belvedere Lake which is really a misnomer.The lake is more of a pond. 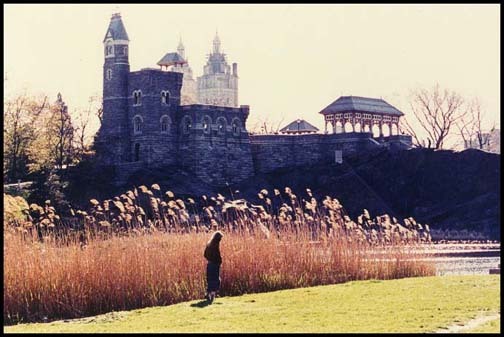 The miniature castle actually gives the illusion that it is a larger structure farther away, therefore making the pond appear as a lake. 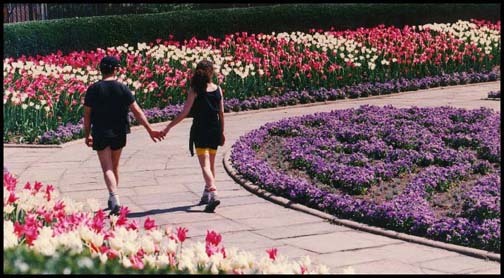 This kind of brilliant landscape design is typical of what you see all over Central Park. 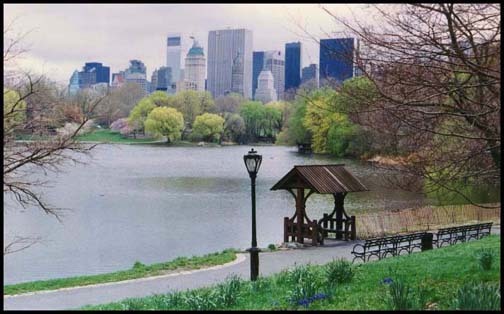 The responsibility for the greatness of Central Park goes to designers Calvert Vaux and Frederick Law Olmsted. It's springtime in Central Park. The most wonderful place in the world for lovers of all ages. Please don't pick the flowers. Being early in the morning, they had not yet started to rent rowboats to the Central Park visitors. In a few hours the lake will be covered with rowboats. No! That isn't me in the photo. I don't know what kind of tree this is but I am going to find out. 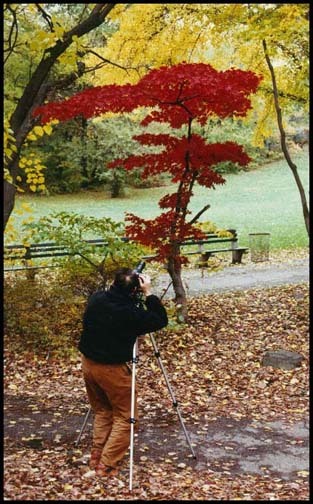 This picture was taken at the north west section of Central Park's ramble area. The tree is a japanese maple. They have a funny 5-pronged leaf that turns bright red, then almost purple later in the fall. I believe that this Imagine Mosaic was a donation from the Italian government at the time of the landscaping of Strawberry Fields. 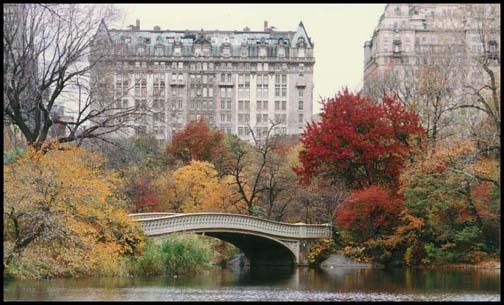 This is an area of Central Park across from the Dakota Apartments where John Lenon lived. John enjoyed strolling here all the time. After his tragic death, the Lenon estate funded the much needed landscaping of this area and the Parks Department named it "Strawberry Fields." 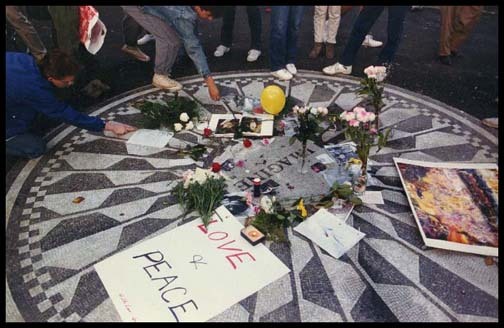 The photograph was taken on the day that Strawberry Fields was first opened to the public in October 1985. Hand made prints are available for display or as gifts.